4R Source More on this topic. View and download some of the generalized nutrient cycles developed by IPNI. A nutrient cycle is the movement and exchange of organic and inorganic matter back into the production of living matter. The process is regulated by food web pathways that decompose matter into mineral nutrients. Nutrient cycles occur within ecosystems. Ecosystems are interconnected systems where matter and energy flows and is exchanged as organisms feed, digest, and migrate about. Minerals and nutrients accumulate in varied densities and uneven configurations across the planet. 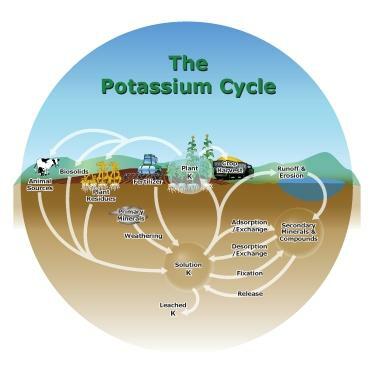 Ecosystems recycle locally, converting mineral nutrients into the production of biomass, and on a larger scale they participate in a global system of inputs and outputs where matter is exchanged and transported through a larger system of biogeochemical cycles. The nutrient cycle is nature's recycling system. All forms of recycling have feedback loops that use energy in the process of putting material resources back into use. Recycling in ecology is regulated to a large extent during the process of decomposition. Ecosystems employ biodiversity in the food webs that recycle natural materials, such as mineral nutrients, which includes water. Recycling in natural systems is one of the many ecosystem services that sustain and contribute to the well-being of human societies. There is much overlap between the terms for biogeochemical cycle and nutrient cycle. Most textbooks integrate the two and seem to treat them as synonymous terms. However, the terms often appear independently. Nutrient cycle is more often used in direct reference to the idea of an intra-system cycle, where an ecosystem functions as a unit. From a practical point it does not make sense to assess a terrestrial ecosystem by considering the full column of air above it as well as the great depths of Earth below it. While an ecosystem often has no clear boundary, as a working model it is practical to consider the functional community where the bulk of matter and energy transfer occurs. Nutrient cycling occurs in ecosystems that participate in the "larger biogeochemical cycles of the earth through a system of inputs and outputs."